Barcodes come in many different forms, but they are all data carriers. All hold GS1 identification (ID) keys and large amounts of data. GS1 barcodes meet the needs of every trading partner along the supply-chain. 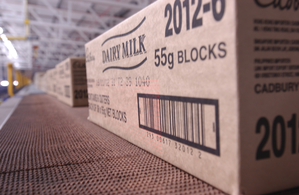 Expiry, validation dates and traceability information — they’re all included. Several types of barcode are available to you, our members, depending on your application needs. Our barcodes include: EAN/UPC, GS1 DataBar, GS1-128, ITF-14 and GS1 DataMatrix. International Article Numbers/Universal Product Codes (EAN/UPCs) are scan-friendly at retail points-of-sale (POS). This set of GS1 barcodes was originally known as ‘European Article Number’ (EAN). They were renamed International Article Number, even though the abbreviation EAN has been retained. GS1 EAN/UPC barcodes are 13-digit (12 data and 1 check). GS1 EAN-13 barcodes are used worldwide for marking products sold at retail POS. The numbers encoded in EAN-13 bar codes are product identification numbers. All the numbers encoded in UPC/EAN barcodes are known as Global Trade Item Numbers (GTIN). 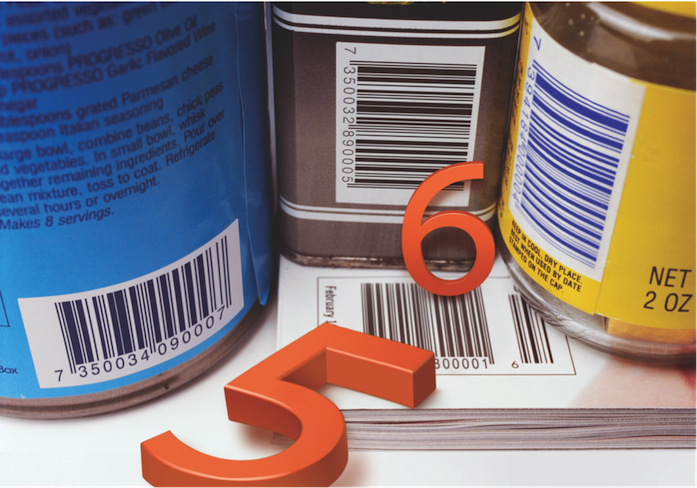 Less common GS1 EAN-8 barcodes are also used for retail goods; however, they are mostly used on smaller items such as confectionery. 2-digit (EAN-2) and 5-digit (EAN-5) supplementary barcodes can be added to achieve a total of 14 or 17 digits. These are generally used for periodicals — to indicate the current year’s issue number; or books and weighed products such as food produce — to indicate the manufacturer-suggested retail price. GS1 DataBar-codes can be scanned at points-of-sale (POS) and comply with global trade item numbers (GTINs). GS1 DataBar is ideal for small, variable weight and hard-to-mark goods such as fresh food produce, jewelry and cosmetics. Your goods’ authentication and traceability is assured, because GS1 DataBar-codes carry GS1 Application Identifiers; serial numbers, and expiry date-relating lot numbers. Globally, GS1 DataBar-codes are approved by the pharmaceutical and healthcare sector for the labelling of items that do not cross retail POS. Annually worldwide, a third of the food produced for human consumption gets spoiled, lost or wasted. 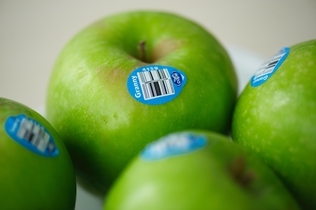 Yet considerable hope lies in the immense capabilities of GS1 Fresh Food Standards and DataBar. Everywhere, DataBar-codes are keeping food fresher and safer for customers. And in Egypt, GS1 DataBar is reducing food waste, capturing vital data at all POS, and providing customers with fresher, safer food. GS1 DataBar was formerly known as Reduced Space Symbology (RSS-14). All GS1 DataBar barcodes are encode with a GTIN-12 or GTIN-13 in a 14-digit data structure. In order to make the GTIN-12 or GTIN-13 a 14-digit data structure, a leading zero or zeros is printed to the left of the GTIN. GS1 DataBar Omnidirectional; GS1 DataBar Stacked Omnidirectional; GS1 DataBar Expanded, and GS1 DataBar Expanded Stacked have omnidirectional scanning capability. GS1 DataBar Truncated; GS1 DataBar Stacked, and GS1 DataBar Limited can only be scanned by a linear handheld or imaging-scanning device. GS1-128 barcodes carry GS1 keys and attributes, but they can’t identify retail point-of-sale (POS) items. Instead, GS1-128 barcodes are used to encode goods’ data for cartons, cases and pallets. They are also used to speedily and accurately track inventories. Additional data and specific information can be encoded; supply-chain security is enhanced with expiry dates, batch/lot numbers, serial numbers and serial shipping container-codes (SSCCs). GS1-128 was developed to provide a global standard for exchanging data between businesses and companies. GS1-128 not only encodes data; it defines the meaning of the data by translating a list of Application Identifiers (AIs). GS1-128 is in itself not actually a barcode language, it is a standard that defines the type of data, and it’s the data’s format. Every GS1-128 symbol encodes one or more AI to indicate that what type of data is encoded. In most cases AI also decides the length and format of the data. When a scanner reads a Code 128 barcode with a leading FNC1 character, the next 2-4 digits represent the applicable AI. For example, if 00 was the encoded data after the FNC1 character, the scanner would expect an 18-digit numeric SSCC-18 to follow. This barcode is used to identify cartons, cases and pallets. ITF-14s are also used to speedily and accurately track inventories. They specifically encode Global Trade Item Numbers (GTINs), and can be printed directly onto corrugated cartons. They can’t identify retail point-of-sale (POS) items. Logistic shelf and master cartons should be identified with a GTIN-14 identifier. These cartons are not read by POS scanners and do not carry a UPC barcode symbol. An ITF-14 barcode encodes the GTIN-14 information. GS1 DataMatrix barcodes are small and hold large amounts of data. They require camera-based scanners and are mainly used for pharmaceuticals and medical hardware production. Goods marked with DataMatrix symbols never pass through retail points-of-sale (POS). This matrix barcode is printed as a square or rectangular symbol. It is made up of dots or squares and bordered by a finder pattern. The finder pattern is partly used to specify the orientation and structure of the symbol. The data encoding of dark or light dots is based on a pre-determined size. As with linear barcodes, Data Matrix has a mandatory quiet zone. This is the light area around the symbol; it mustn’t contain anything graphic because it would interfere with the barcode reading.